Since starting practice a common issue that I have seen is chest pain. This is not the active elephant sitting on my chest, sweating bullets, type of chest pain, but the discomfort that comes with exerting one’s self or some increase shortness of breath doing things that they use to be able to do easily. 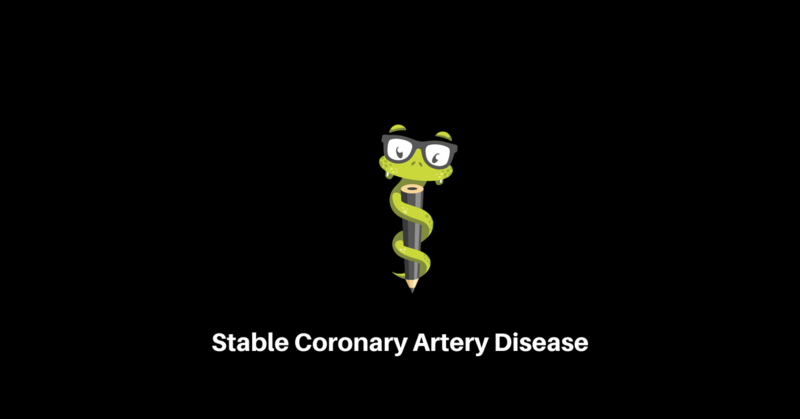 Patients are characterized as having stable coronary artery disease if they have no symptoms, or if their symptoms are controlled with medications, or after a catheterization. Participating in 30 to 60 minutes of moderate intensity aerobic exercise around five to seven times per week has been shown to reduce the risk of cardiovascular mortality. However, it does not reduce the risk of myocardial infarction or need for catheterization in those with stable CAD. Smoking cessation should be strongly recommended for all patients at each visit but should be hit on for those with or at risk for coronary artery disease because morbidity and mortality rates decrease to those of a nonsmoker around ten years after quitting. Studies have found that statin therapy not only aids in the management of hyperlipidemia, but also reduces the risk of cardiovascular events, strokes, and need for revascularization by 20 percent. In fact, statins have shown so much of a benefit at the reduction of cardiovascular mortality that the American College of Cardiology and American Heart Association shifted its focus away from the goal of lowering the low-density lipoprotein (LDL) cholesterol number. It is now recommended that the use of statins be based on the clinical picture and total risk factors that a patient has. 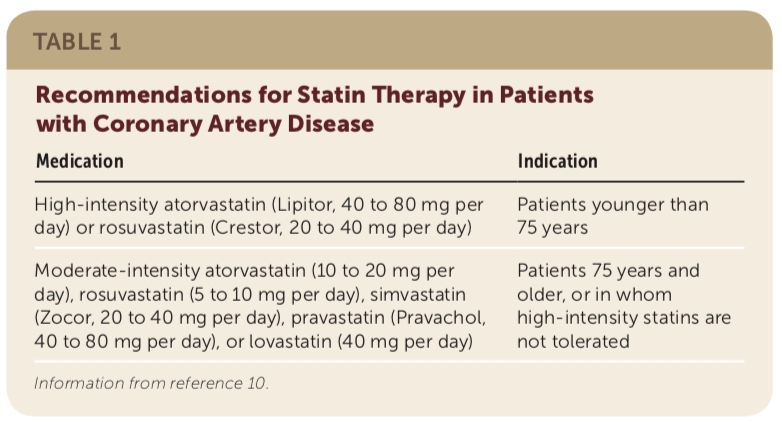 Patients who are 75 years and younger with stable CAD are recommended to be on high-intensity statin therapy, and those over 75 years of age or those who cannot tolerate high-intensity statin therapy should be on a moderate-intensity statin. A large randomized controlled trial found that in patients on a statin versus those on a statin plus fenofibrate that there was no change in the cardiovascular outcome or benefit with the addition of a fibrate.Another extensive study found the same with niacin.1 One thing that the addition of fibrates has been shown to do is increase the rate of myalgia complaints, which then will reduce medication compliance. One study did show that Zetia plus simvastatin minimally reduced the risk of myocardial infarction. This combination of medication can be considered in patients that cannot tolerate a high-intensity statin. Remember, we are no longer specifically treating a number, we are treating to reduce an individual’s risk of cardiovascular complication and death. The ACC/AHA recommends a BP goal of less than 130/80 mmHg for persons with CAD. However, this has not been endorsed by the Joint National Committee nor the AAFP.Data has shown a benefit in the reduction of all-cause mortality and heart failure in patients treated more aggressively. However, there is an increased risk of symptomatic hypotension, acute kidney injury, and electrolyte abnormalities in those treated more aggressively, and typically getting a patient’s blood pressure to this goal will require another medication. Therefore, the decision to treat to a lower blood pressure should be individualized on a patient by patient basis. Regarding the agents used for hypertension, ACE inhibitors, thiazide diuretics, calcium channel blockers, or angiotensin receptor blockers are recommended for initial therapy. The choice between these agents can change due to race, where in African Americans a calcium channel blocker should be used, and in people with diabetes, ACEI or ARBs should be selected. Another trial showed that intensive treatment of diabetes to an A1c less than 6 percent showed a decrease in the percentage of cardiac events, but an increase in the rate of mortality. Regarding the treatment of diabetes in those with cardiovascular disease, metformin should be first and foremost due to its data displaying the reduction in all-cause mortality.1 If other medications are needed for control of a patient’s diabetes, there are a handful of other medications that reduce the risk of cardiovascular death. These include liraglutide (Victoza), semaglutide (Ozempic), and empagliflozin (Jardiance). Another class of medication that should be recommended in patients with coronary artery disease is antiplatelets.Studies have revealed that even a daily baby aspirin significantly reduces the rate of serious vascular events. A baby aspirin (81 mg) has been shown to be as effective as high dose aspirin (325 mg) at reducing cardiovascular events. However, lower dose aspirin reduces the risk of GI bleeding. Another option for antiplatelet therapy includes clopidogrel (Plavix) which has been shown to reduce the rate of cardiovascular events as good as aspirin.However, aspirin is the drug of choice due to its low cost, whereas clopidogrel is used when aspirin is contraindicated, or in individual cases as below. 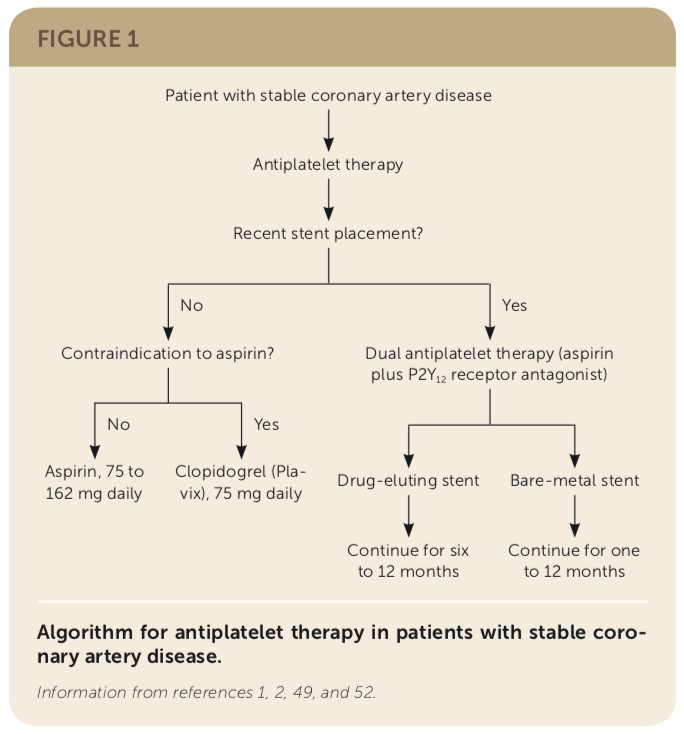 In patients who have had a heart catheterization with percutaneous coronary intervention (PCI), dual antiplatelet therapy (DAPT) is indicated for six to twelve months after placement of a drug-eluting stent or one month after placement of a bare-metal stent.1 Some patients may be instructed to be on DAPT for longer than 12 months, but risks must be weighed including increased risk of bleeding. Regarding DAPT, Plavix and aspirin are often chosen as the antiplatelet agents, but other options such as ticagrelor (Brilinta) or prasugrel (Effient) can be used with aspirin and are more potent than Plavix, but they are only indicated in those with acute coronary syndrome who underwent PCI. A last antiplatelet that can be used is vorapaxar (Zonitiivty) which has been shown to reduce the rates of recurrent myocardial infarction, cardiovascular death, and stroke after MI. Unfortunately, this medication has been shown to increase the risk of intracranial bleeding; therefore it is not regularly used. Angina, or the pain associated with reduced blood flow to the cardiac tissue, is an important component of cardiovascular disease to treat. Several medications can be used to treat this including daily and as needed medications. Beta blockers have been shown to improve survival and reduce the recurrence of myocardial infarction in patients with a recent MI or with reduced left ventricular function.1 However, beta blockers have not been shown to reduce the rate of MI in patients that have never had a cardiac event. 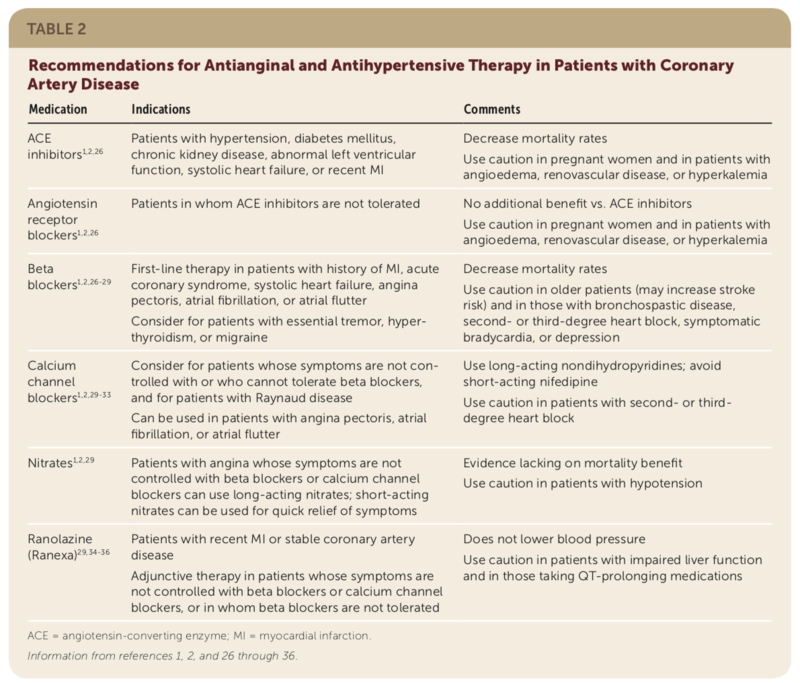 Cardioselective beta blockers, such as metoprolol, atenolol, and bisoprolol, are effective medications to reduce angina and are recommended as initial therapy if tolerated. Metoprolol succinate or carvedilol should be used in patients who have heart failure with reduced ejection fraction (HFrEF). Dihydropyridine calcium channel blockers (CCB) and nondihydropyridine CCBs are effective medications for reducing angina. Long-acting amlodipine or nifedipine ER should be used to avoid reflex tachycardia and ischemia in comparison to short-acting CCBs. Unlike beta blockers, calcium channel blockers do not affect the reduction of mortality in coronary artery disease patients. Also, they should be avoided in patients with abnormal left ventricular function due to lack of benefit and risk of harm. Overall, CCBs can be used as an alternative or adjunctive agent in patients who cannot tolerate beta blockers or whose symptoms are not entirely controlled with beta-blocker therapy. A preferred agent for treatment of angina is rapid acting nitrates and work for the immediate relief of angina. Long-acting nitrates are available as well but have not been shown to reduce the number of angina episodes, improve exercising ability, or decrease the need for rapid-acting nitrates in comparison to beta blockers or CCBs. Long-acting nitrates are often prescribed when beta blockers and calcium channel blockers are not controlling daily angina symptoms. Ranolazine can also be used for angina symptoms and has been shown not to affect blood pressure or pulse and is particularly helpful in patients with angina and low pulse or bradycardia. It can also be used in conjunction with beta-blockers and calcium channel blockers for angina symptoms. Ranolazine, however, does not reduce the risk of myocardial infarction or death and can cause prolongation of the QT interval.It is contraindicated in patients with liver impairment and those who are on medications that are metabolized by cytochrome P450 3A4. Lastly, some patients with stable coronary artery disease may benefit from coronary revascularization with PCI or coronary artery bypass grafting (CABG). These procedures are often considered after patients fail medications to control angina symptoms. It is important to explain to patients that PCI/stenting does not reduce long-term mortality but may reduce their symptoms. The AHA recommends revascularization, primarily CABG, in a handful of situations listed below. 2.UpToDate. 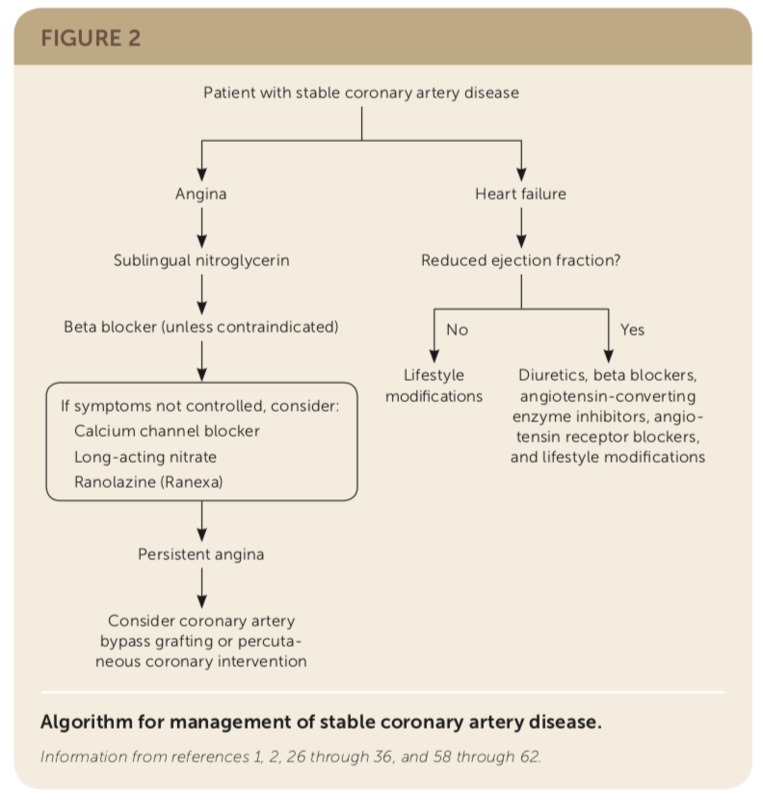 Stable ischemic heart disease: Overview of care. Accessed: March 25, 2018.